Coat weather’s history and sweater season’s vanishing, but – sadly – my winter gut remains. So I’ve been upping my crunches, pounding the pavement, and hitting the gym on a more consistent basis, sharing dumbbells with folks in the same “banish the jiggle” mode as myself. 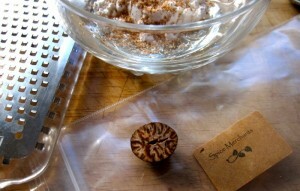 Using fresh grated nutmeg impacts the final flavor profile. Literally. Cathy Banish, a good friend and fellow gym rat, and I have worked out together for years, but never discuss the subject of exercise. We figure we’re working out, why extend the agony by talking about it. Our ongoing thirty year conversation thread, which we pick up as naturally as one would a piece of chocolate, revolves around eating; and while sweating on stair masters or treadmills, we discuss this favorite subject. Like twins who wear the same sized clothes and exchange wardrobe pieces, Cathy and I have identical palates, which is remarkable if you consider the average human has close to 10,000 taste buds. We’re also adventurous eaters, so the diversity of Ann Arbor’s groceries and restaurants is a mecca for us. If she raves about a restaurant or recipe, I know I will love it. Don't allow your garlic to burn! One thing we never discuss, however, are calories or fat grams. Why spoil the fun? 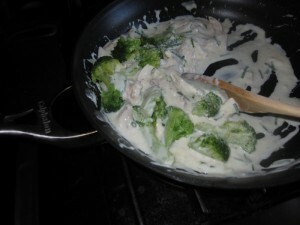 So she surprised me with her inquiries into a low-fat Alfredo I’d made and blogged about 2 years ago. She wondered if it was worthy of her palate and a spin around the kitchen; could yogurt possibly replace heavy cream in an alfredo recipe? Yes and no. Nothing can replace the unctuous, salivating flavors of copious amounts of butter and heavy cream piqued by a pedigreed Reggiano. (The word bears repeating: nothing.) But if you’re trying to trim the sails, the following recipe merits attention. The sauce is not some factory-produced, fat-free “creamy and flavorful” goo. It has enough natural fat and flavor so your body chemistry won’t go into denial, sending you scurrying to the freezer to grab Ben & Jerry’s “Chunky Monkey”, after crashing from your synthetic high. After my conversation with Cathy at the gym, memories of that yogurt Alfredo haunted so I made it again. This time, however, I dressed it up with the addition of chicken and I substituted broccoli for the peas. I ran into Cathy a couple of days later and she, too, had made the recipe adding shrimp and keeping the peas; she was surprised she enjoyed the dish so much and plans to keep it in her recipe repetoire. Just try to say "no" to this creamy sauce! The original recipe was adapted from Rocco DiSpirito’s latest cookbook “Now Eat This!” DiSpirito’s recipe calls for 5% fat yogurt. I’ve used Fage 0% and 2%, both with excellent results. I use (as always) the best Parmesan I can afford for a rich flavor, and added broccoli, chicken and lots of fresh chives; my last recipe included peas. DiSpirito’s recipe serves 4; but after an hour-plus workout, Richard and I polished off the dish without pause. And here lies the conundrum; there is nothing quite like the ravenous hunger felt after a heart pounding routine. Incidentally, Cathy and I aren’t the only people who discuss food over reps. I’m regularly inspired while eavesdropping on recipe exchanges between friends as they sweat. I surmise we’re all in this together, earning the right to enjoy, and not fret, over the next meal. While pasta cooks, melt butter in a large nonstick saute pan over medium heat. Add garlic and cook two minutes, stirring so it does not burn. Combine cornstarch and nutmeg in a small bowl and whisk in chicken stock until smooth. 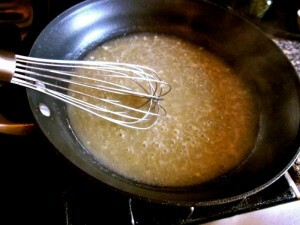 Pour chicken stock mixture into garlic-butter, raise the heat, and bring sauce to a simmer, whisking occasionally. Whisk in cheese and continue whisking until melted; remove pan from heat. Whisk in yogurt until smooth. 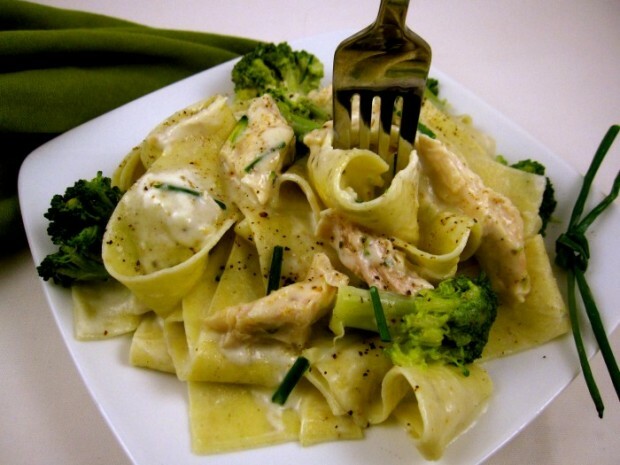 Toss pasta, blanched broccoli and cooked chicken with Alfredo sauce, and gently heat until all ingredients are warm. Season with kosher salt and freshly ground pepper and garnish with chives. * I used 2/3‘s of a bag of the toothsome Al Dente Garlic Herb Papparadelle, but any pasta you enjoy is fine in this dish. More Recipes Filed Under "Pasta & risotto"